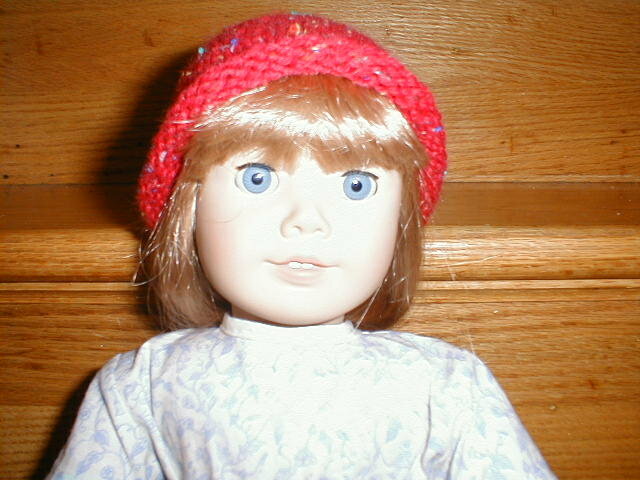 With links to many free knitting patterns for American Girl Dolls and Barbie. Woolworks Dolls and doll clothes - This includes Liberty Cap, Molly's cardigan, Felt slippers, and Swedish hat. Vintage Knits has a cardigan made from a 1904 pattern. Ten Inexpensive American Girl patterns - These are the nicest AG patterns I've found - there's sure to be a project here to meet your needs. These would be easy to alter to suit your whims too! Alas, since I've posted them the author has begun charging a (very small) fee, so they're no longer free, but they're definately worth a look. These use quality yarn and have interesting construction. They are not for beginners, but great for someone who wants an interesting project. There is a beautiful poncho, a crew neck sweater using self-striping sock yarn, a cardigan with seed stitch detailing, a sweater with a fair isle inset, a textured sweater, a colorful sweater knit in Kureyon yarn, a classic Aran fisherman's sweater with lovely cable work, an artsy pullover, a cardigan with sheep designs, and a classic striped open-front cardigan. Free American Girl knitting patterns from majorknitter - These are fairly simple but nice. There are ponchos (fringed, small and striped, and striped with a collar), shawls (with garter stitch stripes, triangular with eyelet), and a simple prayer shawl), a really great college sweater to knit in your alma mater's colors, a top-down crew neck sweater, and several other pics to inspire. There is also a list of other free AG knitting patterns on the web. Knitting on the Net has a nice garter stitch poncho, a ruffled skirt with matching hat and leg warmers (if you can get past the neon color), a simple jester hat, a drawstring skirt, a simple but stylish roll-brim hat, a Bitty Baby layette, and a picture of the Western skirt and vest pattern found here. JG- American Girl Doll Socks - These are really nice looking socks. There's a lot of information here for anyone who wants to improvise, too. American Girl Doll socks - These are made with Lion Brand Wool-Ease yarn. 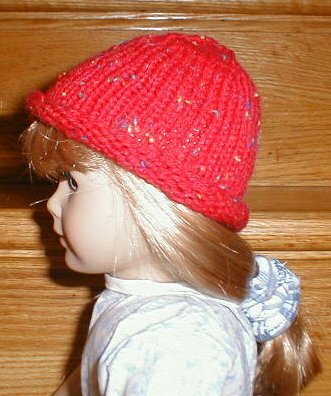 Free American Girl patterns from knitting.about.com - You must see the Austrian Jacket! There's also Mittens, a Skirt, a Cape and Muff, Jester Hat, Pom Pom Hat, Poncho, and several more. Also a fancy day dress knitted from the neck down in the round, using Lion Brand Wool-Ease. Sweater for Barbie - I used this to make a really great Barbie sweater. 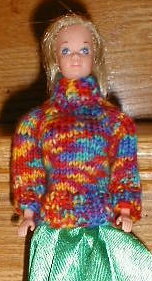 Clothes for Barbie dolls - more from the same author as the above sweater. Two patterns for Linda's Barbie - not my style, but you may enjoy. Free Knitting Patterns for Barbie from about.com - this is a really nice list, with lots to choose from. Another good source is the Woolworks Dolls and doll clothes page. I used this free Sweater for Barbie pattern to make a really great Barbie sweater. I took a chance, since the pattern had no picture, and I couldn't be happier with the results! I used Stahl Wolle Limbo yarn, in color 2533. It's 100% wool. I LOVE this yarn. I didn't do a gauge swatch, just plunged right in, and it went great! The sweater has a neck opening in the back so Barbie can get into it. Now I want to make stuff for my AG doll. For this hat I used Lion Brand Wool-Ease yarn. I did 42 stitches, with #8 double-pointed needles, and joined them. I put stitch markers every 7 stitches, to make 6 sections. I knit 25 rows, then started to decrease (K5, K2tog, then K row, then K4, K2tog, then K row, etc.) until there were 12 stitches left. To finish, I cut the end of the yarn, put through the remaining stitches, and pulled up. Then of course I wove in the ends. If I did it again, I'd use slightly more stitches at the beginning. If you've never used double-pointed needles, this is a good project to start on. It's a bit tricky to cast on, but once you've done the first two rows it's very simple. Get a knitting friend to help out the first time. And if you can do this, you're ready to knit socks! If you prefer not to deal with knitting in the round on double pointed needles, try this pattern by Janice Helge, which produces a similar rolled brim hat but uses regular needles.